There are 23 Assisted Living Facilities in the Reading area, with 12 in Reading and 11 nearby. The average cost of assisted living in Reading is $2,734 per month. This is lower than the national median of $3,346. To help you with your search, browse the 73 reviews below for assisted living facilities in Reading. On average, consumers rate assisted living in Reading 4.1 out of 5 stars. Better rated regions include Wyomissing with an average rating of 4.3 out of 5 stars. Caring.com has helped 8 families in Reading find high-quality senior care. To speak with one of our Family Advisors about assisted living options and costs in Reading, call (855) 863-8283. Reading Railroad is immortalized on the American Monopoly board and seniors can explore this piece of Reading history at the Reading Railroad Heritage Museum. The city is also home to more than 88,000 people and 9.5 percent of residents are aged 65 and older. There are 23 assisted living facilities in the area that cater to seniors, which are licensed and monitored by the Department of Human Services' Office of Long-Term Living. The Reading area is home to world-class medical facilities, including Reading Hospital, in the event of medical emergencies or illness. Reading has many options for seniors who enjoy art and culture. The Ceramic Art and Culture Institute has a gallery and there are workshops and classes available that may interest seniors who want to explore their creative side. The Santander Performing Arts Center also offers residents the opportunity to see concerts and plays in the heart of Reading. Berks Area Regional Transportation Authority (BARTA) provides public transport in Reading. Riders aged 65 and older who have a valid ID are eligible for free transport. BARTA also has Special Services, a door-to-door, shared-ride service for people not well-served by the regular service. Reading has an array of community resources for seniors, including the Berks County Area Agency on Aging, an organization that provides services and advocates for older residents as well as more than five senior centers. Berks County, including Reading, has poor air quality. The State of the Air 2018 report gave the city a failing grade for ozone pollution and a D grade for 24-hour particle pollution. This may lead to poor health outcomes for seniors with respiratory conditions. Taxpayers in Reading who are aged 60 or above do not need to pay state income tax on any retirement income. The state sales tax rate is relatively low and many common products are exempt, including groceries and prescription drugs, which can help the budget of seniors on a fixed income. Assisted Living costs in Reading start around $2,734 per month on average, while the nationwide average cost of assisted living is $4,000 per month, according to the latest figures from Genworth’s Cost of Care Survey. It’s important to note that assisted living rates in Reading and the surrounding suburbs can vary widely based on factors such as location, the level of care needed, apartment size and the types of amenities offered at each community. Financial help for assisted living in the Reading area may be available through a Personal Care Home Boarding Supplement. Otherwise, options are limited to private pay, long-term care insurance and veteran's benefits, according to the Pennsylvania Assisted Living Association. 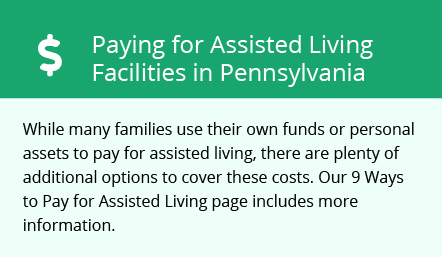 Pennsylvania waiver programs through Home and Community Based Services (HCBS), which allow the use of Medicaid monies to help pay for daily living support, only apply to higher levels of care, such as nursing homes. Reading and the surrounding area are home to numerous government agencies and non-profit organizations offering help for seniors searching for or currently residing in an assisted living community. These organizations can also provide assistance in a number of other eldercare services such as geriatric care management, elder law advice, estate planning, finding home care and health and wellness programs. To see a list of free assisted living resources in Reading, please visit our Assisted Living in Pennsylvania page. Reading-area assisted living communities must adhere to the comprehensive set of state laws and regulations that all assisted living communities in Pennsylvania are required to follow. Visit our Assisted Living in Pennsylvania page for more information about these laws.